The FreeVision 2 oz Counterweight Set for Smartphone Gimbals features four 0.5 oz counterweights for balancing out a phone that's too heavy for the gimbal to stabilize. Many smartphone gimbals are able to stabilize up to a certain weight, but they require counterweights to be used for heavier phones. A phone can be too heavy because of a case or external lenses. The set is compatible with the FreeVison VILTA M and VILTA-SE gimbals as well as most other smartphone gimbals. It includes a bracket that secures around the gimbal's motor arm without any tools. The counterweights screw into 1/4"-20 mounting holes provided all around the bracket. The counterweights feature a 1/4"-20 screw on one side and 1/4"-20 threaded hole on the other, and they can be attached spread out among the different mounting holes of the bracket or stacked up one on top of another if that's what's required for balance. 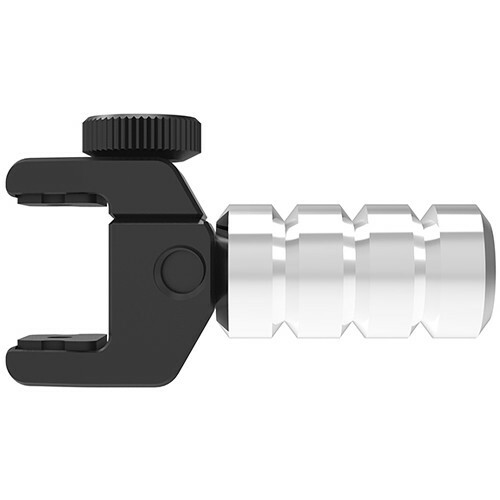 The bracket is width-adjustable for compatibility with most smartphone gimbal arms.